The resignation announcement by Al Franken on Thursday means next year Minnesota will become the sixth state in the 21st Century to have both of its U.S. Senate seats on a November ballot. Two-term DFLer Amy Klobuchar is up for for reelection in 2018 and a special election for Franken’s seat will also be held next November. Since 2000, five states have similarly hosted elections for both of its seats in the chamber: Mississippi (2008), Wyoming (2008), New York (2010), Oklahoma (2014), and South Carolina (2014). Prior to Franken’s resignation, Democratic resources were already projected to be spread fairly thin in 2018 – with the party needing to defend 23 of 33 seats in the midterms (plus the seats of two independents who caucus with their party). Klobuchar has one of the strongest statewide approval ratings in the U.S. Senate and is widely viewed to be a strong favorite to win a third term. And while it may seem that the battle for Franken’s seat (with or without an appointed incumbent running for reelection) creates a strong opening for the Minnesota GOP to pick up a seat in 2018, history suggests that this may be a difficult task. A Smart Politics analysis finds there have been 54 instances during the direct election era in which a state hosted U.S. Senate elections for both of its seats, with nominees being elected from two different parties just eight times – and not once over the last half-century. Since 1913, there have been 33 states who have found themselves in the same situation Minnesota will face in 2018. All told these states have simultaneously held elections for both seats 54 times with Democrats winning both seats 23 times, Republicans winning both 23 times, and the two parties each claiming victory eight times. The last instance of a state splitting its vote for its two U.S. Senate seats on the same ballot took place in South Carolina 51 years ago. In November 1966, the Palmetto State reelected Republican Strom Thurmond while former Democratic Governor Fritz Hollings won the special election triggered by the death of Democrat Olin Johnston in April 1965. Hollings narrowly defeated Democratic-turned-Republican State Senator Marshall Parker by 2.7 points while Thurmond – himself running for the first time as a GOPer – easily beat State Senator Bradley Morrah by 24.4 points. In four of these 10 elections, the general election was more closely decided than the special: Minnesota 1978, California 1992, Tennessee 1994, and South Carolina 2014. That is not expected to be the case in Minnesota next year. To date, five states have hosted elections for both U.S. Senate seats on the same day three times: Idaho (1918, 1950, 1962), Kansas (1930, 1962, 1996), New Hampshire (1918, 1954, 1962), South Carolina (1956, 1966, 2014), and Tennessee (1934, 1964, 1994). It has happened twice in 11 other states: Alabama (1920, 1978), Colorado (1924, 1942), Connecticut (1950, 1952), Georgia (1914, 1932), Indiana (1916, 1926), Louisiana (1918, 1948), Nebraska (1952, 1954), New Mexico (1934, 1936), New York (1938, 2010), North Carolina (1950, 1954), and Virginia (1946, 1966). Seventeen states have never experienced this political semi-rarity: Arizona, Arkansas, Delaware, Illinois, Maryland, Massachusetts, Michigan, Missouri, Nevada, New Jersey, North Dakota, Rhode Island, South Dakota, Texas, Utah, Washington, and Wisconsin. Previous: How Early Would An Anti-Trump GOP Challenger Launch a 2020 Bid? 1 Comment on "Minnesota 2018: How Often Do States Host Elections for Both US Senate Seats?" 1. Were D Senators Edward Lewis Bartlett (C2; 2 year term) and Ernest Gruening (C3; 4 year term) elected on different dates – or even different years (Bartlett in 1958 and Gruening in ’59)? 2. 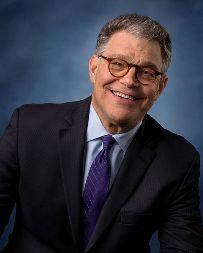 Franken’s elective career just seemed to be an improbable one, even setting aside the apparently credible allegations against him, and even within the limited milieu of the political arena of his adopted home state. Arguably the most significant mark he would leave on the national stage would be that his controversial and belated victory against Norm Coleman in 2008-09 provided his party the SIXTYTH vote to eventually pass the Patient Protection & Affordable Care Act (“Obamacare”) – rather than what would nearly certainly have been an unsuccessful run for the presidency in 2020.